A WWI German 77mm field gun. A field gun is an artillery piece. Originally the term referred to smaller guns that could accompany a field army on the march and when in combat could be moved about the battlefield in response to changing circumstances (field artillery), as opposed to guns installed in a fort (garrison artillery/coastal artillery), or to siege cannon or mortars which were too large to be moved quickly, and would be used only in a prolonged siege. Perhaps the most famous use of the field gun in terms of advanced tactics was Napoleon's use of very large wheels on the guns that allowed them to be moved quickly even during a battle. By moving the guns from point to point during the battle, enemy formations could be broken up to be handled by the infantry wherever they were massing, dramatically increasing the overall effectiveness of the infantry. As the evolution of artillery continued, almost all guns of any size became capable of being moved at some speed. With few exceptions, even the largest siege weapons had become mobile by road or rail by the start of World War I, and evolution after that point tended to be towards smaller weapons with increased mobility. Even the German super-heavy guns in World War II were rail or caterpillar-track mobile. In British use, a field gun was anything up to around 4.5 inches in calibre—larger guns were medium and the largest of all heavy. Their largest gun (as opposed to howitzer) was the 5.5 inch (140 mm) Medium, with a range of about 15,000\16,000 yards. Since about the start of World War II, the term has been applied to long-range artillery pieces that fire at a relatively low angle, as opposed to howitzers which can fire at higher angles. By the later stages of World War II the majority of artillery in use was either in the form of howitzers of 105 mm to 155 mm, or in form of hybrid anti-tank/field guns that had high enough muzzle velocity to be used in both roles. 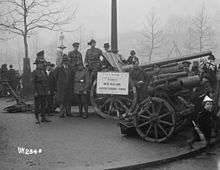 The most common field guns of the era were the British 5.5 inch, the U.S. 155 mm Long Tom (a development of a French World War I weapon) and Soviet BS-3 - an artillery piece adopted from a Naval gun and designed to double up as an anti-tank weapon. The U.S. Army tried the long-range gun again in the 1960s with the M107 175 mm gun; although a high-maintenance item, which after a rash of cracked barrels was removed from service with the U.S., the M107 was used extensively in the Vietnam War and proved effective in artillery duels with the North Vietnamese forces. Production of the M107 continued through the 1980s, and the gun continues to be in service with the Israeli forces. Today the gun finds itself in an area that seems to be gone for good. The class of small and highly mobile artillery has been filled with increasing capacity by the man-portable mortar, which replaced almost every artillery piece smaller than 105 mm. Gun-howitzers fill the middle ground, with the world rapidly standardizing on the 155 mm NATO or 152 mm former USSR standards. The need for a long-range weapon is filled by rocket artillery, or aircraft. Modern gun-artillery such as the L118 105mm light gun is used to provide fire support for infantry and armour at ranges where mortars are impractical. Man-packed mortars lack the range or hitting power of gun-artillery. In between is the rifled towed mortar; this weapon (usually in 120mm calibre) is light enough to be towed by a Land Rover, has a range of over 6,000m and fires a bomb comparable in weight to an artillery shell. This article is issued from Wikipedia - version of the 11/18/2014. The text is available under the Creative Commons Attribution/Share Alike but additional terms may apply for the media files.